Argyle Winery – Their stunning Tasting House offers three distinct flights including sparkling wines and Pinot Noirs. Bella Vida – Enjoy expansive views while tasting wines made 100% with grapes from the Dundee Hills vineyards. Lange Estate Winery – Taste 30 years of winemaking experience with sweeping valley and Mount Hood views. 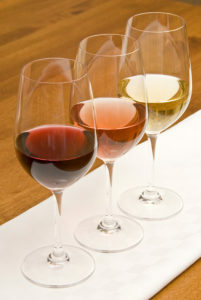 The Four Graces – Sample premium Pinot Noir, Pinot Gris and Pinot Blanc wines in a quaint historic farmhouse. Furioso Vineyard – This stunning tasting room features fourteen-foot-high glass walls for amazing views. Domaine Serene Winery – Relax in the elegant clubhouse while sampling award-winning wines. Archery Summit Winery – Choose your tasting experience from flights to private tours. Stoller Family Estate – This tasting room features glass garage doors that open up to sweeping vineyard views. This is just a sample of the many great wineries in the Dundee Hills. 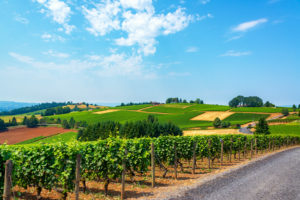 Plan your tour of this popular Willamette Valley wine region, where you can visit your favorites or discover new ones along the way. When you’re ready to settle in for the night, the charming inns at the The Bed and Breakfasts of Yamhill County will be waiting. Come visit us this spring, and experience the bubbling warmth of a spring getaway in Oregon’s wine country.